If you are visiting the Wineries of Old Mission Peninsula WOMP, You will no doubt travel out Center Road (M37) and will eventually arrive at this beautiful lookout. You will pass Blackstar Farms (off Mckinley Road) and Villa Mari (just after Underwood Farms Subdivision). Continue out several miles til just after you pass Bonobo Winery, there is a small parking area where cars pull off and visitors can stop here to take photos of the view over grape vines, Power Island and occasional sailboat in the distance. It's a great place to enjoy West Bay sunsets. Here, Center Road climbs to its highest elevation above the Chateau Grand Traverse Vineyard. CGT Winery is the next driveway to the north. 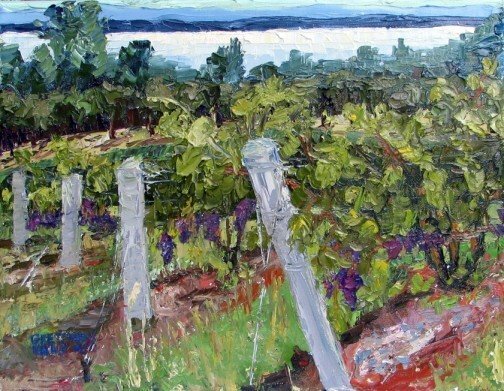 Many of the side roads off of Center Road provide beautiful vistas, cherry orchards, vineyards, and barns to paint. 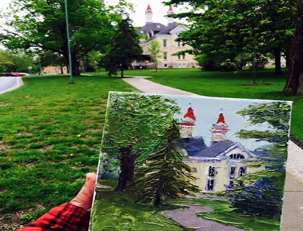 Downtown Traverse City offers a good ole' small town downtown to paint. 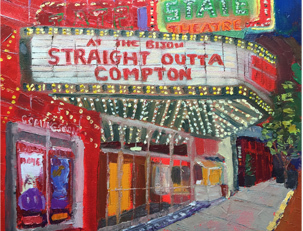 One great place to paint is the iconic State Theatre which has been rennovated and is home to the annual Traverse City Film Festival that takes place at the end of July each year. Great shopping, dining and painting in downtown Traverse City. 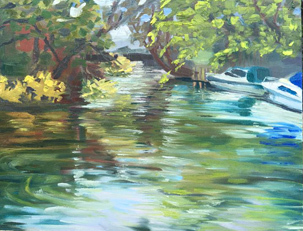 The Crooked Tree Arts Center Traverse City hosts art fairs, downtown artwalks, and annual plein air paintouts. 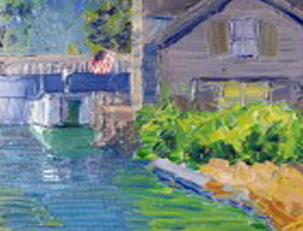 There are many opportunities through area art associations to join in a group paintout. 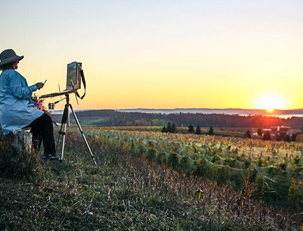 One of my favorite places to paint is at the top of the hill just off the main parking lot at Chateau Chantal. From there, you can look 360 degrees around and find rolling vineyeards, cherry orchards, barns, country roads, east and west bay views, Power Island views, sunsets, sunrises... and the list goes on. 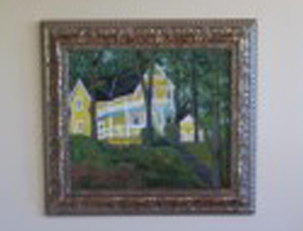 This painting is looking out over East Bay, on the winding road in. Beautiful old Victorian homes line the winding streets of this Methodist Church Chautauqua, built in 1875, which encompasses over 30 acres, 450 homes and 30 public buildings. Performing arts, lectures and spirituality are the focus of this beautifully terraced community called Bay View Association that has been supported by its members for over 100 years. 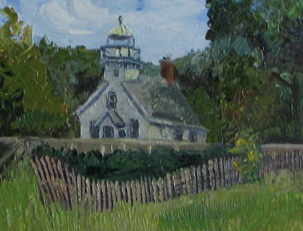 Crooked Tree Arts Center Petosky offers many additional opportunities for art education, and plein air paintouts. 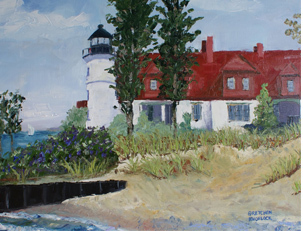 Take Center Road (M37) all the way to the end for this beautiful plein air lighthouse painting location. That's about 17 miles frrom downtown Traverse City. The Old Mission Lighthouse awaits with plenty of parking, and a couple out buildings. You can tour the lighthouse and there's a small shop inside. There is really nothing else out there. The Old Mission General Store is the closest retail establishment a few miles to the East. It is an old fashioned parlour, with ice cream, candy and pickles. This area of Traverse City called The Village at Grand Traverse Commons has been developed into a nice community of art galleries, wineries, bakeries, and specialty retail shops (more shops in the Mercato below Building 50). There is a handful of really great restaurants housed in these old buildings which were once home to some 2000 mental patients when it was a State of Michigan run Asylum. The most spectacular of the restaurants there for lunch or dinnertime dining, is in the basement of Building 50 -- Trattoria Stellas, but Spanglish and the Underground Cheesecake Company are also extremely tasty and more casual. All of the buildings are made of this very distinguishing light yellow brick facade. It makes for a very striking architectural painting with the red tourits and black roofing. Plein Air location near Elk Rapid Maple Bay Farm GT Regional Land Conservancy information. The Maple Bay Natural Area is on both sides of M31 north of Acme, about halfway to Elk Rapids. It consists of a few trails on the western edge of the property that lead to East Bay. 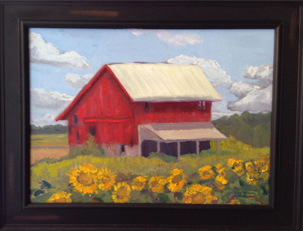 I usually paint on the East side of M31, where farmers have leased the land and in most previous years have planted sunflowers. There is a narrow driveway that leads to a vacant old victorian house where you can park. The county owns that property and that's where I park to get this view of the barn & sunflower fields. 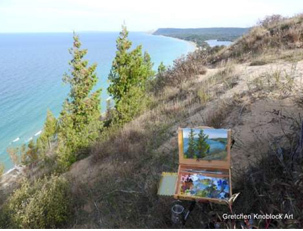 Plein Air location at Esch Road, South of Empire, Mi Sleeping Bear Dunes National Lakeshore Park information. From M22, go west on Esch Road. It dead ends at Lake Michigan. The views are spectacular in both directions. To the north the view is of Empire Bluff. And to the south about 1/4 mile down the beach, you can find Otter Creek and sweeping views of the Platte Plains. There is a nice network of trails to hike through the Platte Plains. It's a birder's paradise. Fishtown is an old fishing shanty village in Leland Harbor on the shores of Lake Michigan which is where Carlson's Fishery, a commercial fishing operation, is still in existance oday. The old tugboats and buildings are very cool to paint - gray, rustic wooden structures that are occupied in the summer by small shops selling fresh smoked fish, cheese and wine, local designer clothing, and souvenirs. There are several subjects to paint here. Boats in the marina, the new Marina building, the fishing vessel JOY, the shanties, or to the south, Van's Beach. From here you can also take about a $30 RT Ferry ride to South Manitou Island to paint the lighthouse or ranger station for the day. (This is also a part of the Sleeping Bear Dunes National Lakeshore). After a few hours of painting, I like to stop in the Cove restaurant for a world famous Chubby Mary (bloody mary with a smoked chub, cream cheese and crackers). The whitefish dinners are great at the Bluebird too. The Old Art Building usually has an art event going on, and Fishtown Preservation Society sponsors an annual plein Air paintout to support historical Fishtown. Plein air location near Frankfurt, MI information about Frankfurt/Elberta. Just on the south side of the Betsie Lake inlet, and the Frankfurt breakwall is the small village of Elberta. Head toward Lake Michigan, and make your way up the tall hill- (go left on Bye St.), just past the Cabbage Shed and the Trick Dog Gallery. A great place to paint is just at the edge of the parking observation area at the top of the hill. This is the view from that top parking lot. Bye St. continues down the other side of the bluff to a very beautiful beach with rolling dunes and mounds of baby's breath growing among the native beach grasses. Here, you can take in the beautiful breathtaking southern views of Arcadia Dunes CS Mott Nature Preserve. It is about a 1/2 mile hike to get back to this observation deck area. There is ample parking, and a nice wide dirt hiking trail that is really a beautiful walk. And then you get to this view along a wooden boardwalk. It can get really windy, so plan on that. Along the trail, you can also stop to paint the view of South and North Bar Lakes, seen here off in the distance. 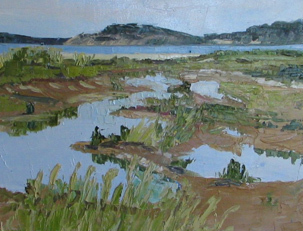 North Bar is another great place to paint, and is also about a 1/2 mile hike in, but a really fantastic place to swim and play in the warmer waters of the inlet. South Bar is adjacent to Empire Beach and the view south is awesome, and you can park right at the water, so it's a very easy plein air location. If you need sustinance, The Friendly Tavern is the closest place to grab a casual but really deliciowhitefish or walleye dinner. The far point is the Whaleback just south of Leland very near to North Lake Leelanau. There are also trails atop that bluff if you're interested in exploring. 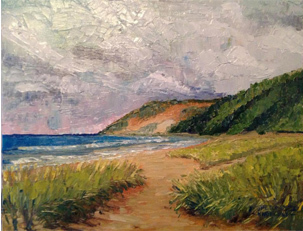 The beach at Glen Haven near the Great Lakes Boat Museum ( the old red Cannery building) is another of my favorite places to swim and paint! There is a really wonderful trail system. 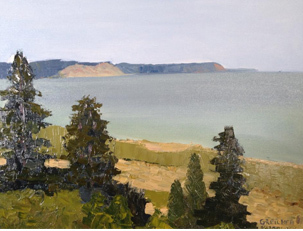 I love to paint this view of Sleeping Bear Point, with South Manitou Island in the distant waters of Lake Michigan. Great rock hunting in the water, so water shoes recommended, but not necessary because the beach is sandy. You can park quite close to the water, maybe only a 40 yard walk down any one of the many sand trails that lead to the water's edge. 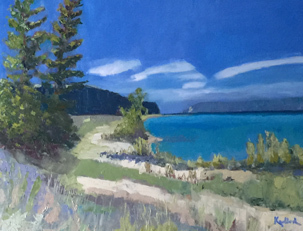 Amongst the many paintable subjects, are the Cannery, a boat, the Coast Guard Station, Sleeping Bear Point, North Manitou Island, South Manitou Island, sand dunes, vast sweeping views of clouds and water, and multiple sandy pathways through wild Junipers. The area of swales and dunes at the mouth of the Platte River where it empties into Lake Michigan is another beautiful beach with its own unique and very recognizable landformations. All along the River are painting opportunities. The Riverside Canoe Livery store provides rental floating tubes and kayaks giving plein air access to remote areas if you're interested in an adventure. Otherwise, parking is available at the mouth of the river, close to the beach. It's about a 1/4 mile walk along a stony riverbed to get to the sandy beach, and I usually cross the river at the very end, where it's at a shallow point to paint from atop the bluffs. Point Betsie Lighthouse is one of the most photographed lighthouses in Michigan. It is situated on the shores of Lake Michigan a few miles north of Frankfurt, MI. The parking is very close to the lighthouse which makes this a really easy plein air location. The white washed wooden buildings with red rooves distinguish this area and there are multiple homes and outbuilidngs nestled into the local dunes which also make for great paintings. Historic lighthouse tours are available.